Ken won his first chop at the age of 15 at New Norfolk. 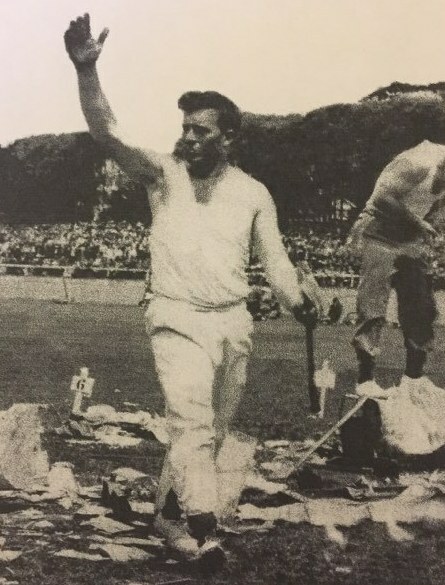 He won his first Championship in 1939, at the Royal Hobart Show, from the late Joe Tate and Maurice Duggan (Snr). Ken has won several Underhand and Standing Tasmanian, Australian and World Titles. He was better known in the underhand events, and regardless of the size or types of wood, he was always the hardest to defeat. HE still holds the record in the 12 inch underhand State and Australian Championship with a time of 13 seconds. His most memorable moment was defeating the late Jack O’Toole in both Standing and Underhand World Championships at the Royal Hobart Show. Ken was the winner of the 15 inch Underhand Tasmanian Championship for eight consecutive years at Franklin. Also the 42 inch (girth), for eight consecutive years at Bream Cree and Sandfly. He won the 15 inch World Title at Scottsdale, defeating Australian Champions Les Caldwell and Jack O’Toole. Ken’s last World Title was at Westbury in 1960, the 10 inch combination in 24.20 seconds, defeating all Tasmanian Champions. Ken has been competing for 63 years and is still quite keen to have a cut whenever he can. 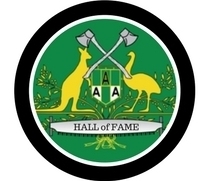 He has been a great mentor to several axemen, including some Tasmanian Champions and dearly loves the sport.